The Block Island Chamber of Commerce (tel 800-383-2474, info@blockislandchamber.com) can answer many of your questions about local services. Block Island was chartered as the Town of New Shoreham in 1672 (here's more Block Island history). The town's ordinances prohibit camping anywhere on the island (except Scout groups, etc), sleeping overnight in cars or on beaches, riding motorcycles on the beaches, and shellfishing without a license. 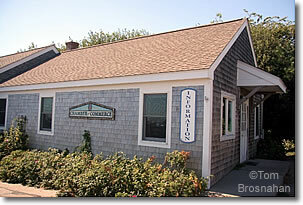 The Block Island Chamber of Commerce Information Office.